Tarek Chemaly: The Arc de Triomphe delivers some real graffiti via the Gilets Jaunes. The Arc de Triomphe delivers some real graffiti via the Gilets Jaunes. Well, this is not to give direct political opinion about the Gilets Jaunes sweeping France (even if I am certainly not to the right politically) but what happened this weekend in Paris with riots engulfing the capital engendered one of the rare real graffiti works I have seen since a long time. Let me explain. When I did my interview with seminal journalist Maria Chakhtoura from whom I carried the torch about documenting graffiti on walls via my Archewallogy book collection (find them for free here!) she said something that resonated deeply in me. For her graffiti ended when the Lebanese combatants ceased using coal to express their opinions on the go and reverted to stencils. I can understand her thinking, Beirut like many other cities is now inundated with graffiti which asks for the permission of the municipality before being executed, long gone is the spirit of the "damn them I am expressing my opinion" which led me (as basically the researcher who put graffiti into academia in the region!) to sound the death knell of it (such as here). 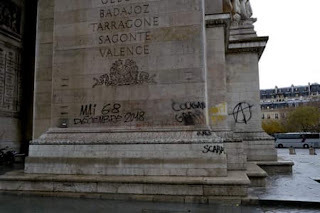 This weekend someone sprayed "Mai 68 Decembre 2018" on the arc de triomphe in France, and one can see the anger and rebellion in it. I actually am proud to have seen the documentary of "68" in its pre-release version which centers around the social movements which emerged that year (text: Patrick Rotman, direction: Patrick Barberis) and if this documentary shows anything it's that all social movements which started that year ended up as enormous fiascos. Still, a good graffiti belted from the heart is a good graffiti belted from the heart.